It was a nice birthday party, despite the fact that the only 'guests' of the honouree were the Spanish navigator Ferran Marco Alcayna and the Czech mechanic Petr Pokora, and the venue the first of the two marathon stages of the 41st Dakar Rally on Thursday 10 January. 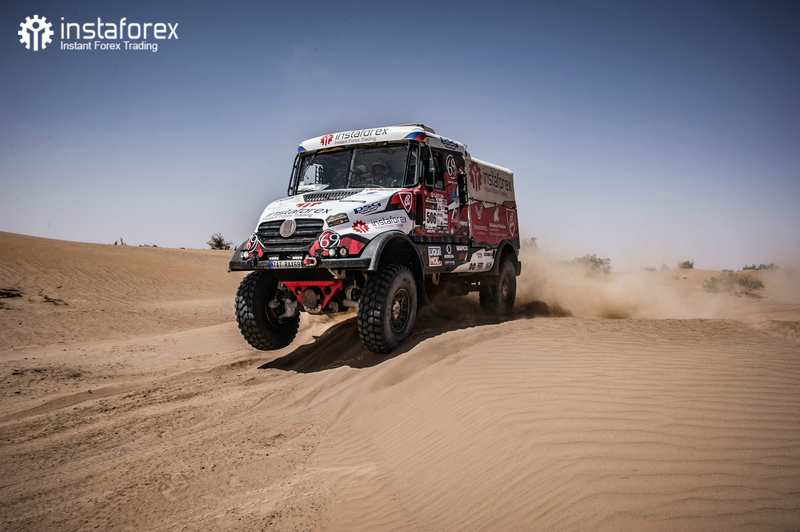 The crew of the Tatra Jamal – Queen 69 of the Instaforex Loprais Team was successful on the route between Arequipa and Tacna and the truck with the starting number 507 moved five ranks up in the interim overall ranking of the truck category. Stage four as prepared for the truck pilots first included a 85-kilometre pass to the speed test start, which was divided to two separate sectors. After the opening 205 kilometres a neutral zone prepared the entry to the second racing section with a lot of the unpopular fech-fech sand. The route further included soft dunes which the freshly 39-year-old pilot of Frenstat pod Radhoštěm really likes. All this was followed by another 174 km of the pass to Tacna. Loprais' crew struggled since the first control point for a rank among the Top 10 in the truck ranking and arrived in the finish with a 26-minute loss after the winner Karginov as the ninth-ranking crew. Unlike most of its major rivals the Czech crew did not fall into any serious problems and returned to the Top 10 of the interim ranking, in particular to the 8th overall rank. This was the first of the two marathon stages. Therefore the evening bivouac was closed to other team members but the racing crews and the crews had to service their trucks before the next stage alone. “Another demanding day is over, but what else can you expect here in Peru. We are glad we have covered the first of the two marathon stages and try to do our best to prepare well for the second. Tomorrow will be no less demanding,” noted Ales Loprais. On Friday 11 January the trucks and their crews will return to Arequipa for the rest day scheduled for Saturday. Before that they will have to cover another race section in the dunes of the Ilo region, the longest of the whole competition for the trucks (and for cars as well) with its 452 kilometres. Its beginning will in addition be made attractive for media from the visual point of view by the mass start where the competing vehicles will set off for the stage in groups.